Hi all, we are getting some updates on the “Discovery Sale” being held online only, alongside the Gallery Auction at Cooper’s this week. Items from both events are being displayed simultaneously, although the “Discovery” items are being sold separately (with lower-ticket stuff, it seems). This is most definitely more Barbara’s than our kind of setting and interest, so we will just highlight the BOOKS! (Always a shared interest!) and Egyptian things that wound up in “Discovery” — but there are also some other assorted items (all marked as being Barbara’s). BOOKS! 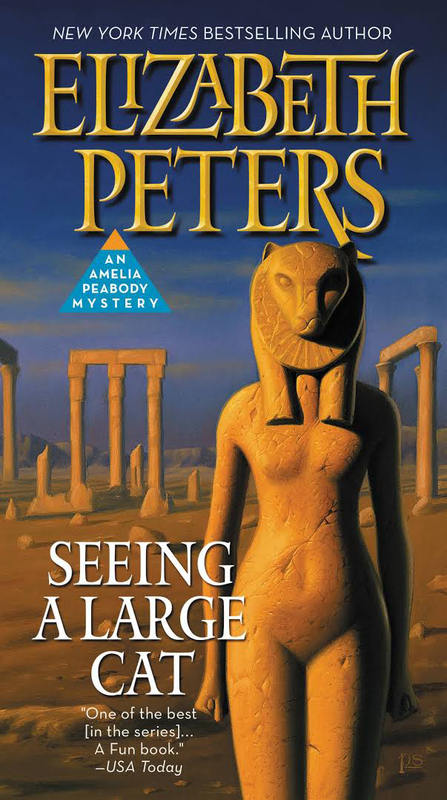 … on Egypt; Sherlock Holmes & other detectives; novels from Edgar Rice Burroughs to a set of Mark Twain (a favorite author of both Barbara’s and her father’s); books on architecture & art, old-fashioned readings (Baroness Orczy, Rafael Sabatini, John Buchan, George MacDonald); books Barbara enjoyed since when she was younger (LM Montgomery, Alcott, Wren); more of the latter with some extra favorites thrown in (like Aiken and Farjeon); a mix of some of the above that adds in Noel Streatfield and E.Nesbit, among others; some L.Frank Baum; mysteries …. and, for the “Another Shirt Ruined” crew — H.Rider Haggard, along with “Sons of the Sheik” (really?) and some of her well-worn T.H. White & Elizabeth Goudge. Within those covers, many feasts. Besides books on Egypt, there are Egypt-themed figures and framed prints and toys (fun to look at, for those who share Barbara’s sense of the frivolous). Oh, and of course, there has to be …. a cat. 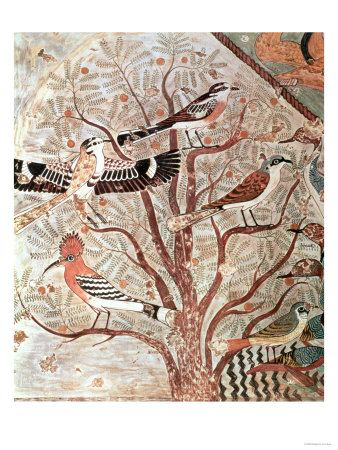 12th Dynasty to 20th Century…did someone pounce on the birds…? Just to follow up on the Gandalf post commentary on the scenes, here are the two side-by-side…. 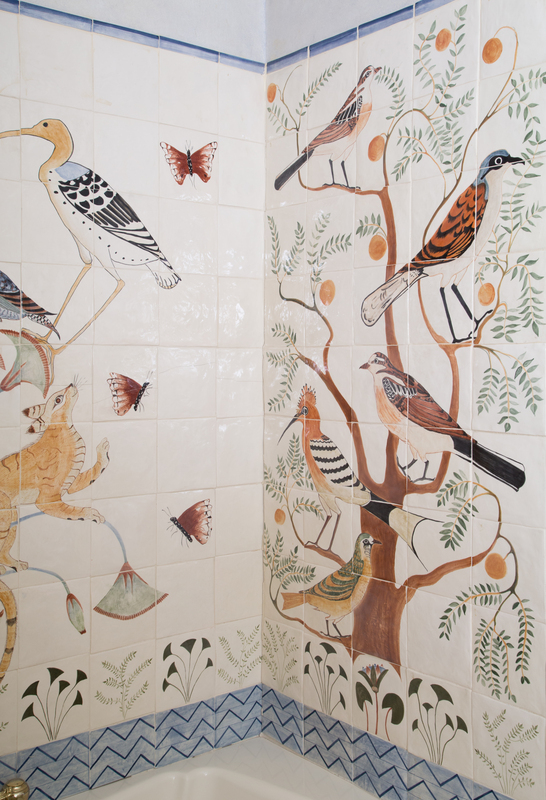 the panel to the left in Barbara’s tiles are indeed Amarna — ish, as some have pointed out…. but not a copy of anything particular. 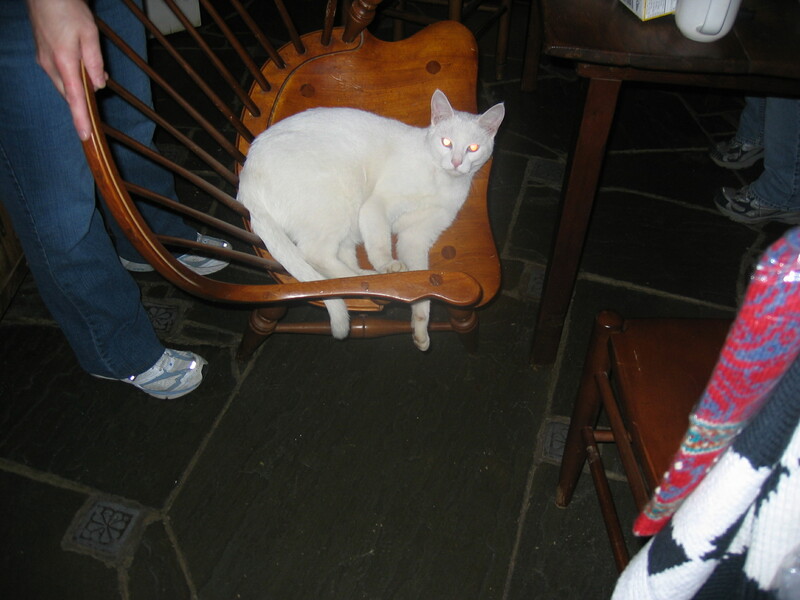 Continuing our saga of the MPM Manor cats, we promised to tell you about Gandalf. 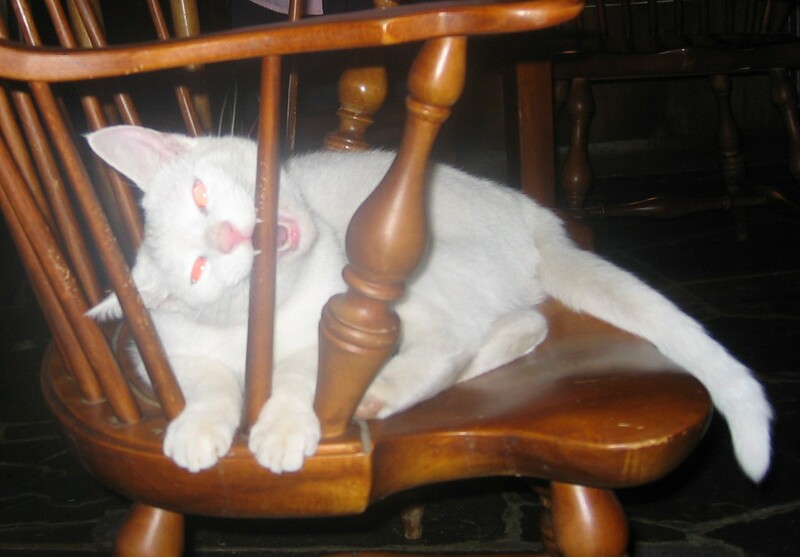 Here he is fiercely claiming the chair he’s in as his own. (One of us had the temerity to suggest that we might like to sit there.) (It’s actually one of the kitchen table chairs where friends and family sat for meals.) (Silly us.) 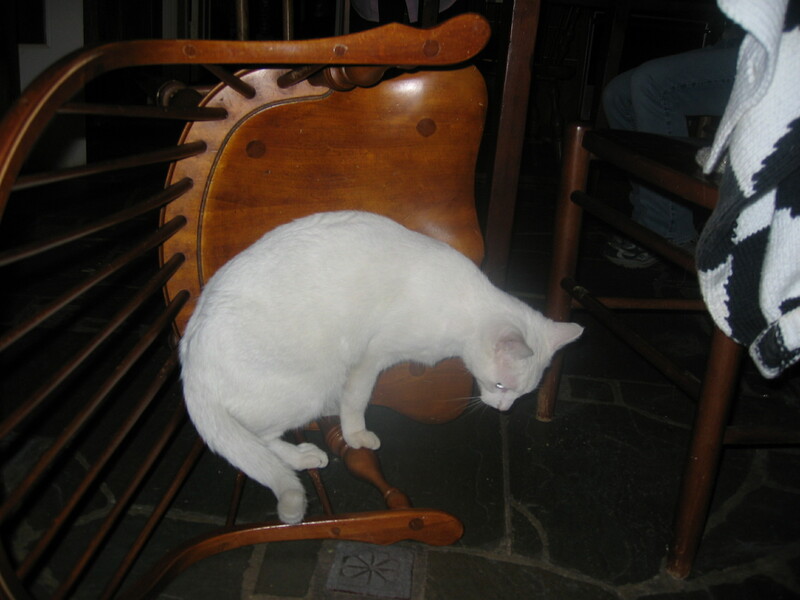 More on the battle for the chair later in this post…. As Barbara noted in her newsletter, Gandalf was “unfortunately … extremely friendly and morbidly fascinated by vehicles of all sorts. We had to put up signs reading ‘Deaf Cat’, since he had a tendency to rush out and fling himself down in front of cars and trucks.” The sign must have worked, as nobody ever hit him. Let’s just say, Barbara’s cats were just a wee bit entitled. **And in our next post, Gandalf’s first owner, a bookstore maniac, shares his BOOKSHELF pics! 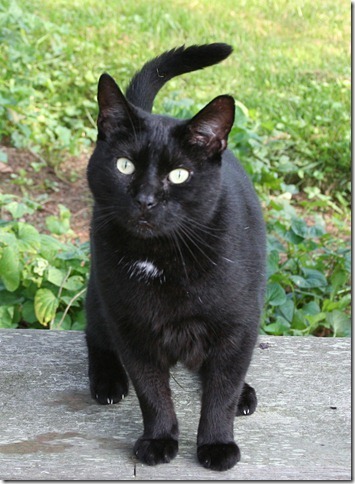 And so we thought we’d introduce some of the beloved MPM Manor cats. You can find an earlier picture of him in an MPM newsletter (although the text mostly focuses on his sibling Gandalf — more on G later!). Barbara always said that Sethos would likely just disappear back into the woods whence he came some day — but it turned out that he stuck around til the end, on both counts. Two tough old coots!